We select the best art glass available. Our glasses are the product of American companies and represent the best art glass produced in the world today. Variation within the glass is normal and expected within acceptable limits. Sometimes the glass becomes in short supply, or can become unavailable. We try to keep a reasonable inventory on hand, but, unfortunately, some of our best glass becomes unavailable. We will keep you informed about availability. We are always on the lookout for new and exciting glass, so feel free to call 800-497-3891 anytime for a free sample piece. This soft, gentle blue is a late summer afternoon. A very soothing color in any application. A super-rich tropical blue-aqua. Think Mediterranean Sea. Another cool green in a teal tone whisked with white wispy streamers. Delicious! A delicate pale blue with transparency makes an ethereal vision. Beautifully textured. The blue of a storm-tossed sea. Highly dramatic, the photo above shows too much white. Let us send you a sample to see for yourself. Spectrum does a series of these baroque glasses. Characterized by dramatic swirls of various colors, the blue shown here is a mix of a rich cobalt blue, white and clear. Again, expect some variations in the formation of these swirls, but a sound consistency in the character of this wonderful glass. Sadly these baroque glasses are no longer being made, but we still have an inventory . Please inquire about availability. This clear glass has many streaked bubbles included in the glass. We sand blast the interior (or exterior) of this glass to give a smooth overall light transmission without showing the bulb. 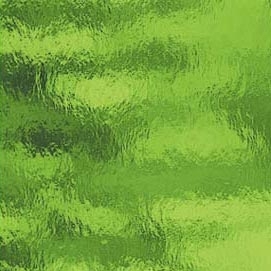 This glass has no color and is a very dramatic presentation in contemporary or traditional settings. A soft blend of light purple and white opal, streaking lighter and darker throughout the sheet. As with so many of the glasses that we use, the true quality of the color and texture must be touched to be appreciated. A mixed swirl of cobalt blue and pink with a white opal base. The pink-cobalt glass is a gorgeous warm combination. The colors speak for themselves. A stunning color combination of jewel-like quality. As a focal point in the right setting, it is unique. A regal purple color, a blend of deep violet and pale purple with a water glass texture. Stunning in a room of light tones. A wonderfully balanced blend of the above colors in a very natural manner. Like an alabaster or marble, but better! 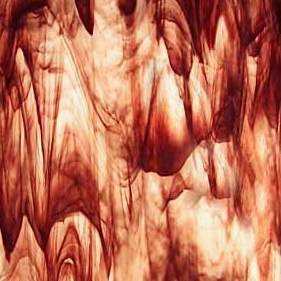 A regal red color, blended with swirls of white and clear. Stunning in a room of light tones. I have very little of this glass on hand, but it will be back in production within a few months. Call for availability. This is a Chinese red, more than fire engine red, a brilliant pigeon's blood. The wispy white inclusions give added character, but when the glass is illuminated, it is ruby red. Called "Inferno" it is an eye-magnet in any room. A mix of orange, red and yellow glass with streaks of clear and white. They don't get any hotter than this. In a dining environment, however, the overall effect is one of warmth and intimacy with a jewel-like drama as a bonus. Peppermint is characterized by dramatic swirls of various colors, a mix of a rich red, pink and white. Again, expect some variations in the formation of these swirls. Sadly these baroque glasses are no longer being made, but we still have an inventory . Please inquire about availability. Another difficult glass to photograph. The reds are a richer "oxblood" than this photograph shows. See our Vortex in this glass to get a better idea of what it looks like. Please request a sample...this is a most delightfully complex and warm toned glass. A true cobalt blue, ocean blue, winter sky blue. When lit, this glass has a clear vibrancy that a photograph cannot capture. Stunning is an inadequate adjective. A rich mossy, forest green streaked with white wispy random swirls. A deep & subtle green with streaks of white throughout. This muted green is very elegant and understated. A mossy green trending to the yellow rather than blue undertones. A rich, tropical green is mixed through by a white opal glass. Emerald and moss are two other descriptive words that apply. As a dramatic accent in any room, this glass is unique. A super tropical green, lush and cool with a wonderful texture. As with all clear art glass, we will sand-blast the interior to diffuse the light so hot spots are minimal. Another difficult glass to photograph. A complex of green, pink and clear glasses blend with a unique palette which definitely reminds one of heather. This ivory glass is an off-white with a slight yellow tint. Not quite as neutral as the 307 Streaky White glass. 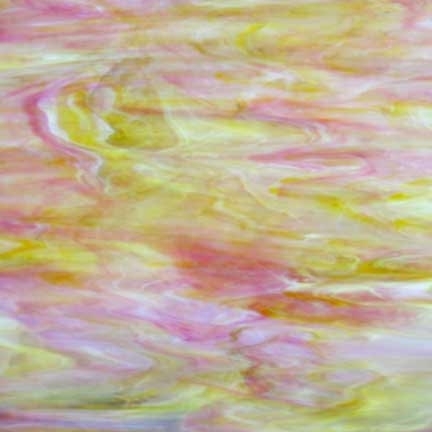 This is a marbleized glass with a very delicate touch and suitable for many interior color schemes. A subtle glass devoid of color, only grey and white are included. A very cool and subtle glass, it will be very useful in strongly accented interiors or in minimalist spaces also. A warm but basically neutral color, this understated glass is ideal for contemporary environments from the desert to the sea. This is a neutral white glass with a wispy figure reminiscent of alabaster. One of our most popular glasses, it introduces no new tones into the decorative lighting scheme and thus blends well with any colors. This photograph is perhaps a little too gray; rather the effect is like a white sky with a streaking of pale gray clouds. It can come with an iridescent finish with a subtle overtone of blue/green/red blush randomly scattered reminiscent of an abalone shell. The pale amber glass shown here is a more subtle version of the 315-02, having less amber and more white in it. This is a beautiful marbleized glass with a very delicate touch and suitable for almost any interior color scheme. Spectrum's medium amber with a white opal swirl. A continual favorite, it's warmth adds a congenial flavor to interior settings. This glass appears paler when unlit, and develops its rich butterscotch amber only when light is passing through it. This is the darkest of our amber glasses. It is a very rich dark honey or perhaps molasses in tone with streaks of white which show up as lighter tones of amber. You need to see this glass in your hand to appreciate its warm character. Pearl Opal, Teal Green, Manganese Purple, all randomly mixed into a delightful melange. This baroque glass has extremely pale, delicate tints of champagne swirled in the white and clear glass, even paler than this photograph suggests, when back lit. Ask for a sample; it has a subtle beauty hard to describe or photograph. Sadly these baroque glasses are no longer being made, but we still have an inventory . Please inquire about availability. This is a baroque glass comprised of a swirl of black, white and clear glasses. No color tonality is introduced with this glass, making it useful in cases where color conflicts are not acceptable. It's random patterns add a wonderfully spontaneous quality. Sadly these baroque glasses are no longer being made, but we still have an inventory . Please inquire about availability. All our glass is produced in the United States, without doubt the makers of the finest art glass in the world today. We buy our glass in whole sheets from a variety of manufacturers whose quality and consistency meet our requirements. Other glasses we fuse to create new looks, textures, colors and patterns. Please call us for samples of any of our glasses. It is the best way to be sure of the qualities you are looking for. There is no charge for this service. The photographs we show are representative of each style, but there are always some variations as one would expect from such glasses. Each sample photograph is taken of a piece about twenty-four inches square. The photo colors have been tested by us to be as accurate as possible, however due to variations in monitor setup, we cannot absolutely guarantee this accuracy as you see it. Where exact duplication is critical, please call or email us for a sample of the glass. We provide this as a necessary service without charge or obligation. Also, be aware that the glasses we show have a different tonal quality when lit and unlit due to the inherent qualities of reflected and transmitted light. Get the samples you would like to see and test them yourself. We are happy to provide a reasonable number of samples at no charge. For best results, we recommend using dimmer switches so you can have total control over the intensity of the light coming from the sconces. We try to carry a complete inventory of glasses, but some are easier to come by than others, and sometimes certain colors or styles simply become unavailable. By the same token, there are frequently new and wonderful glasses being produced, and we will introduce them into our product line. We can special order just about any glass you may want if you know of something that we don't show on our website. Please remember that some of these glasses are totally handmade by craftsmen pouring ladles of molten glass onto iron tables and smoothing them with iron rolling pins. As with all hand-made glasses, there are apt to be small imperfections called "seeds" which naturally occur in the glass. This is one of the characteristics of art glass and as such should not be considered as an imperfection in the finished product. Please call us for free samples of the glass.